Mt. Zion House of Prayer. 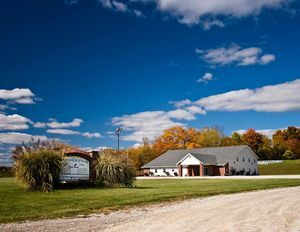 Mount Zion House of Prayer was founded in 1995 in Utica, Ohio, USA. The church was an unaffiliated congregation before joining the Biblical Mennonite Alliance as one of its charter members in August 1999. In 2006 the church helped in the formation of Mohican Valley Door of Hope in Danville, Ohio. In 2015 the leading minister was David Troyer, the congregational membership was 75, and the average weekly attendance was 92. Thiessen, Richard D. "Mount Zion House of Prayer (Utica, Ohio, USA)." Global Anabaptist Mennonite Encyclopedia Online. May 2012. Web. 25 Apr 2019. http://gameo.org/index.php?title=Mount_Zion_House_of_Prayer_(Utica,_Ohio,_USA)&oldid=140742. Thiessen, Richard D. (May 2012). Mount Zion House of Prayer (Utica, Ohio, USA). Global Anabaptist Mennonite Encyclopedia Online. Retrieved 25 April 2019, from http://gameo.org/index.php?title=Mount_Zion_House_of_Prayer_(Utica,_Ohio,_USA)&oldid=140742.